Maybe against all expectations, but Amsterdam is a real family-friendly city. No doubts to visit Amsterdam with kids. 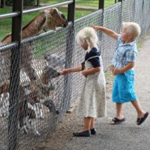 There are many in- and outdoor attractions for all ages throughout the city. All over the city, there are a lot of public playgrounds with slides, swings, sandboxes and jungle gyms to challenge our smallest kids. Furthermore most of all the major attractions (for example the Rijksmuseum) have special activities/ tours for children. Some even have corners/ mini – museums dedicated for children. Most of the museums in Amsterdam are free of charge for children under 13 years old. Therefore the city is great to visit with toddlers as well as with teenagers. Many places will be enjoyed by adults as well! And of course there are low budget (free) attractions, lovely places just outside the city. 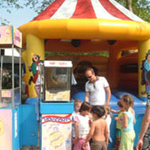 Places where kids always have fun like ‘Amsterdamse Bos’ (forest), ’de Zaanse Schans’, small animal farms and the beach. Throughout the city, basicly every restaurant and café is child-friendly. And in summer the number of places increases! Around May more lovely open air places are open. Real hotspots during summer are the swimming/ paddling pools throughout the city. Paddling pools can be found in the Vondelpark, Westerpark or Beatrixpark. And even in the forest, ‘het Amsterdamse bos’, a few lovely pools and places can be found where you can swim and relax with (smaller) children. In summer, all the parks in the city have perfect spots to relax in Amsterdam with kids or play some football. 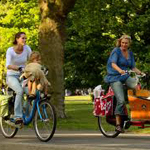 A great way to explore Amsterdam with kids is rent a bike. During spring and summer season there are several spots where you can cool down and jump in the water. At the Amstel river for example, a mobile swimming pool (with bar) is placed in this river. Nevertheless, most teenagers would probably love to explore the city and go shopping, go to the movies or visit the Ajax Stadium for example. 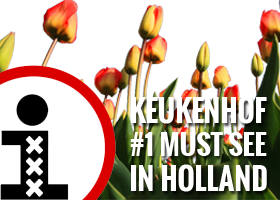 There are of course numerous museums and attractions not mentioned above, but suitable for all ages like the Artis Zoo or the Anne Frank House. I want to use Amsterdam Holland Pass with my family. I have ten year old kid. Please indicate what are the attractions/Museums included in the Kids Holland Pass. In case we want to cover more than 5 attractions/museums, then how to use kids Holland pass for that. Please note that most of the museums are free for children, so if you are planning to visit more museums than attractions you might be better off not buying the Holland Pass for Kids. Amsterdam Event Calendar – What’s on?